The public is invited to join a performance of Christmas songs by the London Gay Men's Chorus on Saturday. The 'Make the Yuletide Gay' concert will feature carols like Silent Night as well as festive favourites including Santa Baby. The gig marks the chorus' debut at The Barbican and will be presented by actor Simon Callow at 7.30pm. The concert will be in British sign-language, interpreted by performance signer Russ Alderson. Charlie Beale, musical director of The London Gay Men's Chorus, said: "Make the Yuletide Gay promises to be the brightest, funniest and most festive concert in London this Christmas. "With a mix of carols known and loved by everyone, and some fun, modern Christmas music, we'll be kicking off the festive season in our own unique style." 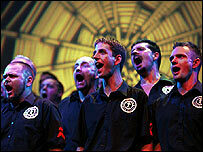 The London Gay Men's Chorus is the largest and best known gay choir in Europe, with almost 130 singing members.